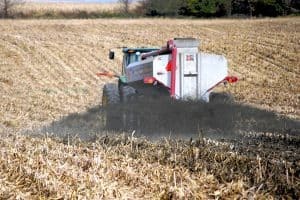 Manure is a valuable fertilizer source for crop production as it provides major macronutrients (nitrogen, phosphorus, potassium) and micronutrients (zinc, iron, manganese, etc.). In addition, manure increases soil organic matter which leads to better soil structure and water holding capacity while giving a boost to beneficial soil microbes and earthworms. When applying manure, it is important to remember to work safely and avoid cutting corners. Besides general machinery safety, there are many additional hazards that manure may pose. As you work to apply manure before the ground freezes, keep this safety checklist in mind for agitation, pumping, transportation, and application. Are livestock and personnel removed from the manure basin area where they might inhale dangerous gases? Is the pit or basin well-ventilated? Have you disconnected any electrical equipment near the pit or basin that may cause a spark? Do you have the proper personal protective equipment (self-contained breathing apparatus and harness with lifeline) on hand in case you need to enter the pit or basin? Do you have an Emergency Response Plan with updated phone numbers and contacts? Are all signal and brake lights working properly on equipment for road transportation? Have you and other personnel been trained in biosecurity to prevent spread of livestock diseases between farms? Do you understand the rules regarding setbacks and applying near sensitive areas? Do you know what to do and who to contact in case of a manure spill?